I keep having to cut my videos down to keep them under the 100 MB limit since my video camera records in HD and the files are huge. I accidentally cut off the beginning of this one where I asked her to find "blue." There was also a cute ending involving clapping and cheering, but that had to go too. And here's a picture that I LOVE of her enjoying her sweet new freedom. 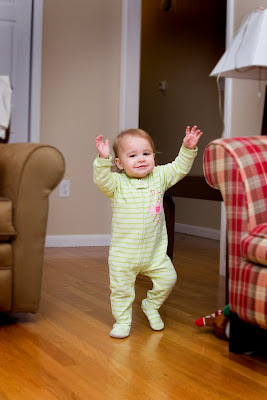 I think I'll be very sad when she learns to walk without her arms flailing about. That is amazing - Thanks for letting Janice know! You can really see the little wheels turning. She just amazes me. You should call Oprah or someone like that. How cool. We're all very proud! What a list of accomplishments in the past two weeks! Wow, she is amazing. When she writes her first book, please let her know I am the first in line for an autographed copy!! Megan, she is way ahead in her reading skills, as if you didn't know already. I love how she looks at each card to make sure she is picking up the correct word. Wow!! this simply freaks me out! I love it! Even my kindy can't do this! Way to go Eleanor! !